The holidays are a special time when our kitchens are full of special treats, so don’t let your breakfast be left out. 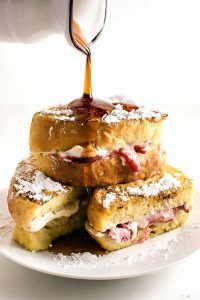 These French toast recipes are perfect for chilly winter mornings and add a little decadence to start your day. Add a dollop of homemade whipped cream, a pour of Michigan maple syrup, and a side of fruit and you’ll be good to go! 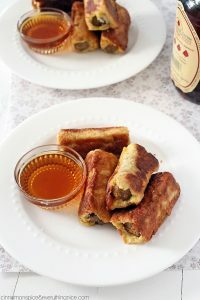 Here’s a spin on Pigs in a Blanket, only instead of rolling up sausage in fluffy pancakes, sausages are rolled in bread and then fried for the perfect, meat-filled French toast stick. Kids will love them and the kid within us will enjoy them, too. Cook the sausages according to package directions. In a shallow bowl whisk the eggs, milk, cinnamon, and vanilla together. Roll each sausage up in a piece of bread and trim the ends off to fit the sausage – or not – it’s up to you. Heat a clean 10-inch skillet over medium heat and add a pat or two of butter. When the bottoms are browned, turn with tongs to cook and brown on all sides. Go outside the traditional with this easy-to-make-for-a-crowd French Toast Bake. It’s like a coffee cake combined with the flavor and crunch of the favorite breakfast treat. Unlike similar recipes, no overnight chilling is required. Spray a 9×13 pan with cooking spray and preheat oven to 350 degrees. In a large bowl, add the eggs, milk, heavy cream, sugar, ½ cup brown sugar, vanilla, cinnamon, and nutmeg. Chop the bread into 3/4 – 1 inch cubes and put it in the bowl with the egg mixture and toss well until all the liquid is absorbed. In a small bowl or a food processor add the flour, remaining ½ cup brown sugar, cinnamon, and salt and mix. 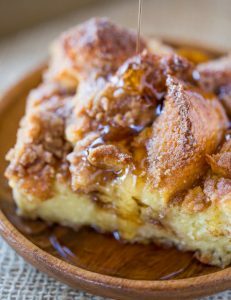 Pour the bread and egg mixture into the pan, cover evenly with the brown sugar-butter topping and bake for 45-50 minutes or until the top is crispy and the center is no longer wet. A dish that impresses the eyes as well as the taste buds, the sweet, tangy taste of fresh strawberry is perfectly complemented by smooth cream cheese. Make this one for brunch and you won’t be hungry until dinner. Using a stand mixer (or a hand mixer + large bowl), add softened cream cheese, sour cream, powdered sugar, and vanilla. Beat on low until cream cheese has broken down, then mix on medium high until incorporated, about 2 minutes. Use a spatula to scrap around the sides and bottom, then beat again on medium for 30 seconds. Set filling aside. For the strawberries, slice them as thin as you are able. If using frozen strawberries, use a paper towel to absorb any extra juice; wet strawberries will cause the french toast pieces slip and be hard to flip while cooking. When strawberries are sliced and ready, place them in a small bowl with 1/4 cup sugar. Gently toss strawberries until they are all coated in sugar. In a small bowl with a flat bottom (or pro tip: use an aluminum pie tin), whisk together milk, eggs, vanilla, and cinnamon. Make sure cinnamon has fully mixed with the wet ingredients and is not just floating on top, still dry. Spread a layer of cream cheese filling on one side of sliced French bread. Filling should be spread thin but still thick enough to thoroughly cover bread. Spread another thin layer of cream cheese on a new slice of French bread, then gently press it to the other slice with the strawberries (like a sandwich). Spray a skillet with cooking spray and warm over medium heat. Dip the French toast into the egg and milk mixture, coating both the top and the bottom. Drop the French toast in the skillet and cook each side until golden brown, about 2-4 minutes per side. To make flipping easier, use a thin spatula to scoop under the French toast and gently press your finger on top to secure it while the toast is flipped. Save time by cooking 2-3 sandwiches at once.